Takashi Kunitani, Spaceless Space: Six, 2018. 63 x 1 5/8 x 1 5/8 inches x 6 /160 x 4 x 4 cm x 6. Breath, glass, argon, transformer, and cord. Ulterior Gallery is pleased to inaugurate its third year with Takashi Kunitani’s second solo exhibition with the gallery, Spaceless Space. The exhibition opens on Saturday, September 8 with a reception for the artist from 6 to 8 pm. 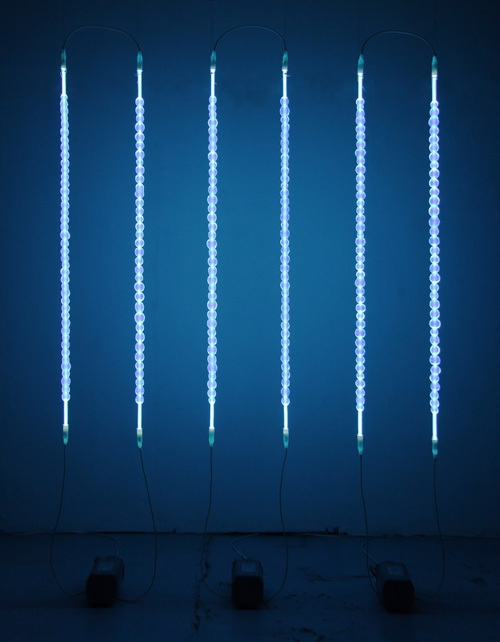 Kunitani’s ongoing series of installations are comprised of multiple neon tubes that the artist deforms with his own breath. Through this breathing process, Kunitani expands the internal volume of the glass tube, blurring the boundary between the inside and outside of the sculpture. 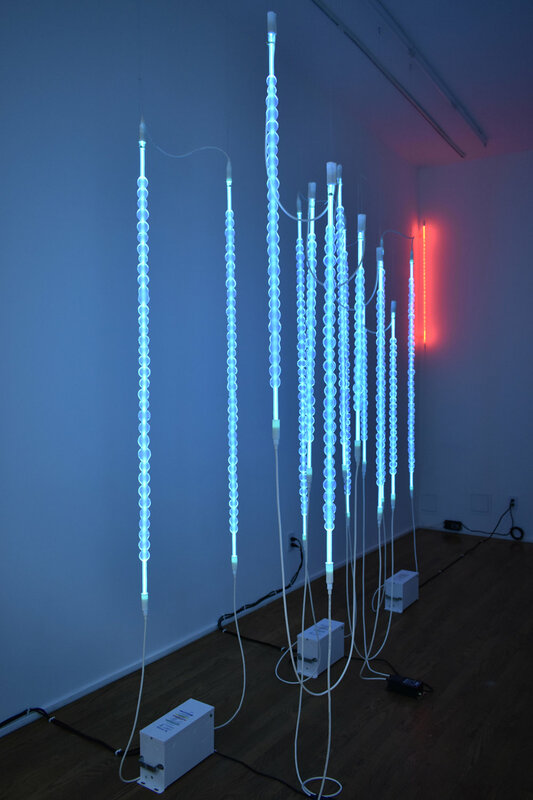 In these installations, viewers see the chemical elements neon and argon captured within the multilateral, transparent surface of the sculpture. This ephemerality of the object itself, combined with the expansive visual nature of blown glass and radiant neon tubes, translates the space where Kunitani’s neon is enacted into an expanded volume without clear boundaries between object, space, and viewer. 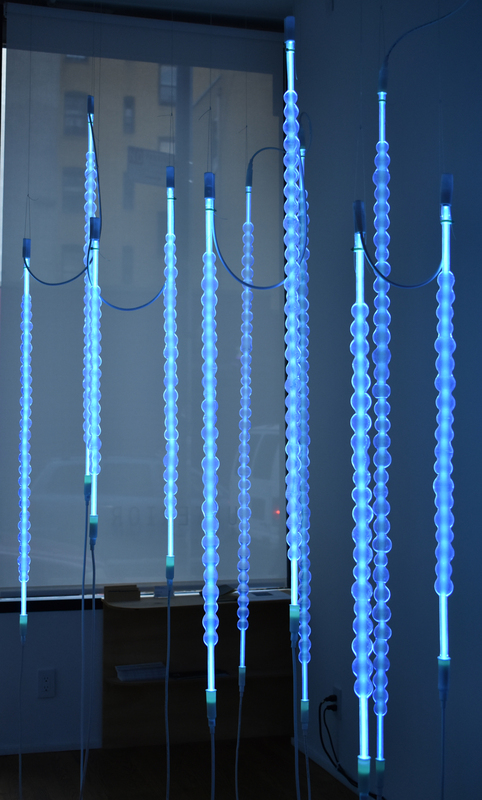 For this exhibition at Ulterior, Kunitani will realize a full-room installation of red (neon) and blue (argon) tubes. The artist states: “The placement of these two different colors reflects my idea of a board game, as if we were in the game without knowing the rules or how each piece should be placed… We just need to judge where to be, how to see, from the given circumstances, as the ephemeral viewing experience is unique to the individual.” These neon works form an expansive apparatus designed to activate the tension between viewer and artwork. Decisions made by visitors as they move through the space individualize the viewing experience, making each moment unique. In the years since he began working on it in 2001, Kunitani’s series of sculpture installations, Spaceless Space, has become his signature work. While room-sized installations of works from this series have been shown at museums in Kyoto, Hyogo, and Osaka, and in other galleries and non-profit spaces in Japan, the exhibition at Ulterior represents the first full-scale exhibition of these works that the artist has exhibited outside of Japan. Takashi Kunitani was born in Kyoto, Japan in 1974 and graduated from Seian University of Art and Design in Shiga Prefecture, Japan in 1997, where he studied under Norio Imai, one of the prominent Gutai artists. Kunitani’s works have been the subject of numerous solo and group exhibitions, including: Something Red, Kyoto Art Center, Kyoto, Japan (solo, 2018); Takashi Kunitani: Deep Projection, Hyogo Prefectural Museum of Art, Hyogo, Japan (solo, 2015); Two Passages, Nuit Blanche Kyoto 2012, Kyoto Art Center, Kyoto, Japan (2012); Today’s Artist 48: Takashi Kunitani—The Vertical Horizon, Osaka Contemporary Art Center, Osaka, Japan (solo, 2007); Criterium 54: Takashi Kunitani, Art Tower Mito, Ibaraki, Japan (solo, 2003). He lives and works in Kyoto. OCULA OCULA INSIGHT: Asia Contemporary Art Week: Diary #1: 5–15 September 2018.